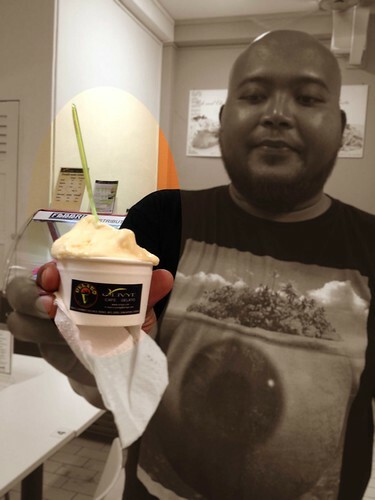 Well, I did mention Halal gelato in my previous entry. 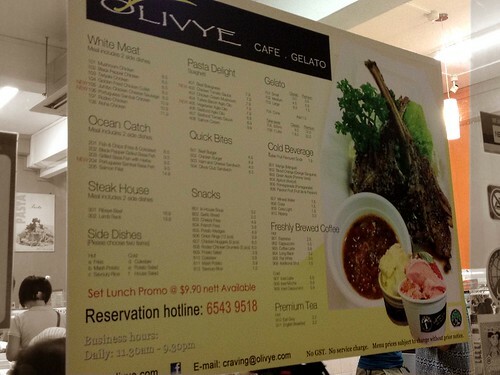 Right next door to Mr Teh Tarik. Apparently, it's not just a scoop shop. It operates as a cafe, actually. I only knew it right then. Had I known earlier, we could have dined here instead. I thought that they are new in this line and that this is their 1st shop. When I checked their WEBSITE, well it turns out that they are quite a household name at NIE & NTU, having their operations there since years back. 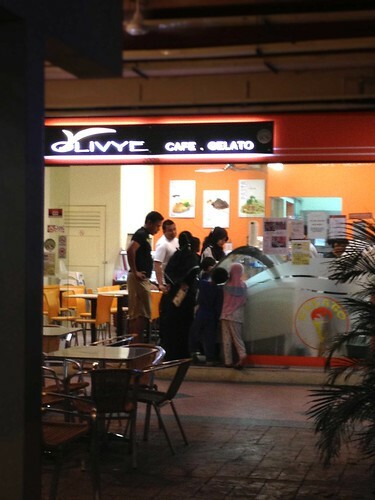 However, the gelato is available only at this Changi Village branch. The flavours in this fridge are (trying hard to recall, here) from bottom left: pistachio, melon, chocolate, (can't remember what), raspberry, bubblegum (or is it blueberry? ), salted caramel, coffee (or mocha) and mango. On the top left (not seen in pic) is an interesting flavour. Chilli chocolate. I was like, "Whut??!" The lady behind the counter simply smirked and gave me some to try. She remarked that it's a hot favourite (no pun intended there). True enough, there's only a small amount left. I asked to try the pistachio flavour, just to counter that heat. 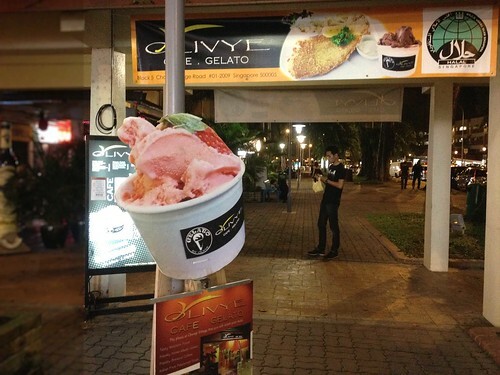 Chilli in my gelato? No thanks. 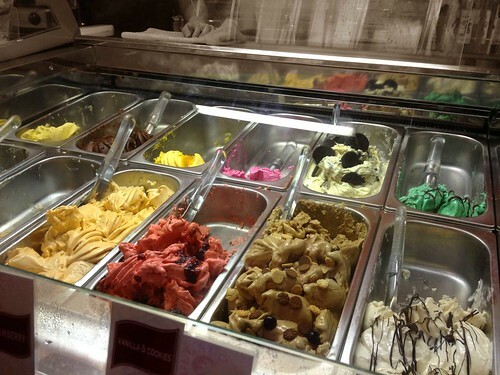 I want to enjoy my gelato, thank you. Not wince whenever I swallow. I also tried the salted caramel. It was yummy! Then I went over to the fridge near the front after the crowd subside and scanned the various flavours. Sorry, I really can't recall the flavours by now. On top left was definitely durian, then it's dark chocolate, (I dunno what's the other yellow gelato beside it), strawberry, cookies & cream, mint. Bottom row: (I dunno what's the yet-another-yellow-one), mixed berry, (some almond-cherry-cookie-mix) & vanilla?? Seems like they mix both the Premium & Classic flavours together. Please note that the pricing differ for either type so you gotta take note when choosing. 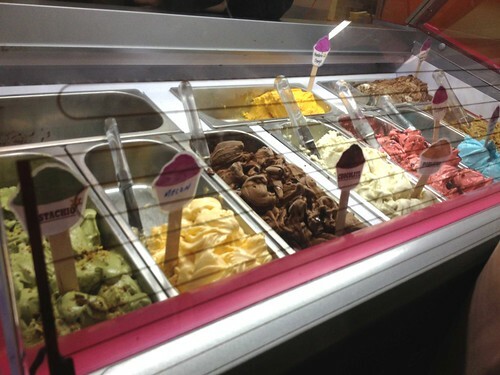 You can check the gelato menu HERE. Awesomely refreshing taste! Feels like you're biting into the actual Hami melon with each scoop. Oh, didn't snap a pic but my mum chose that almond-cherry-cookie mix. Thankfully it only carried a faint hint of the very pungent almond scent & flavour (my whole family abhor that!). My mum especially was relieved (she said she dunno why she chose that one either). But it was nice actually. The taste appear to be very... English. Don't ask me why. On the left is durian (I just can't resist!!) and on the right is orange swiss-chocolate (one of my favourite combo flavour!). What??! 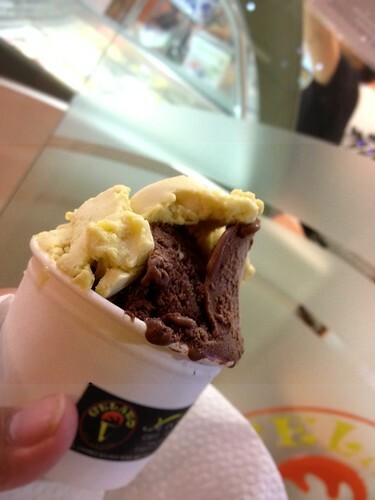 Nothing wrong having durian & chocolate together right? 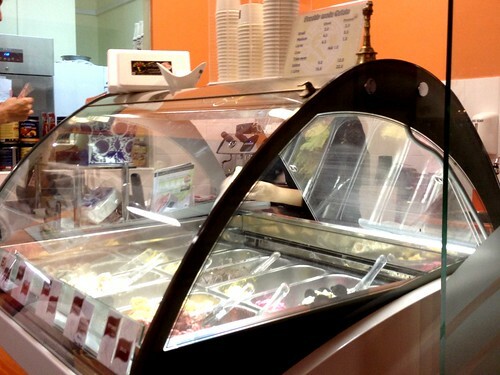 As you know, gelato doesn't come cheap and even this Halal one is no different. The small portion is at least $3 so you can more or less gauge the pricing, eh? PS: Kinda' realise that I have yet to try the enticing schtuffs from that Chocolate Origin shop! Oh didn't know they were halal!